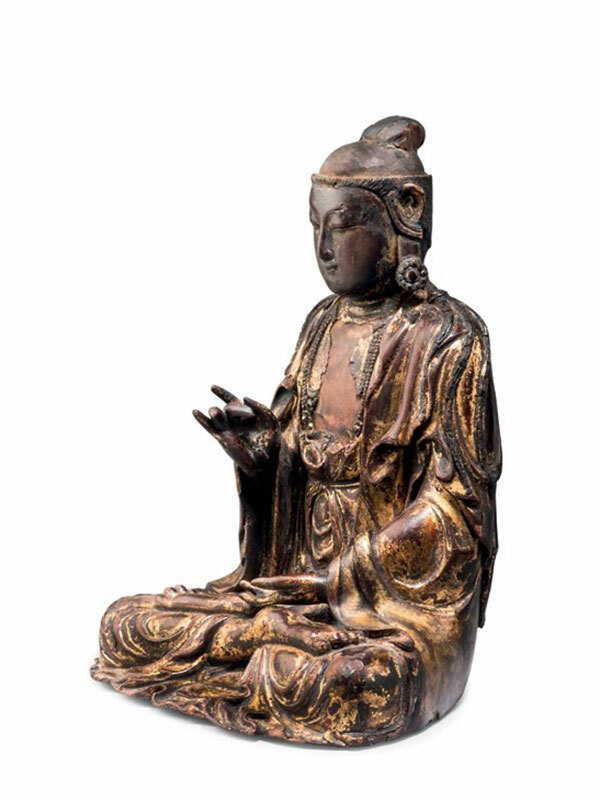 A gilded lacquer image of the bodhisattva Guanyin, seated in the padmasana lotus position. The deity is dressed in a loosely draped, long-sleeved, pleated robe, which is fastened with a belt knotted around the waist, and has graceful folds draped around the folded knees. The right arm is half-raised and with her right hand she expresses the karana mudra. Her left arm rests on the upturned feet and the fingers are extended. An elaborate necklace with swags and pendants encircles her neck. Her coiffed hair is neatly tied into a high chignon, leaving two long strands on the shoulders. The elegant face has a serene, half smiling expression and is flanked by elongated earlobes, adorned with floral-shaped ear pendants. The figure is covered in a layer of well-preserved gilding above the thick, painted lacquer surface. The base reveals the original wood body, which has been wrapped with multiple layers of plain-weave fabric underneath the lacquer and gilding. 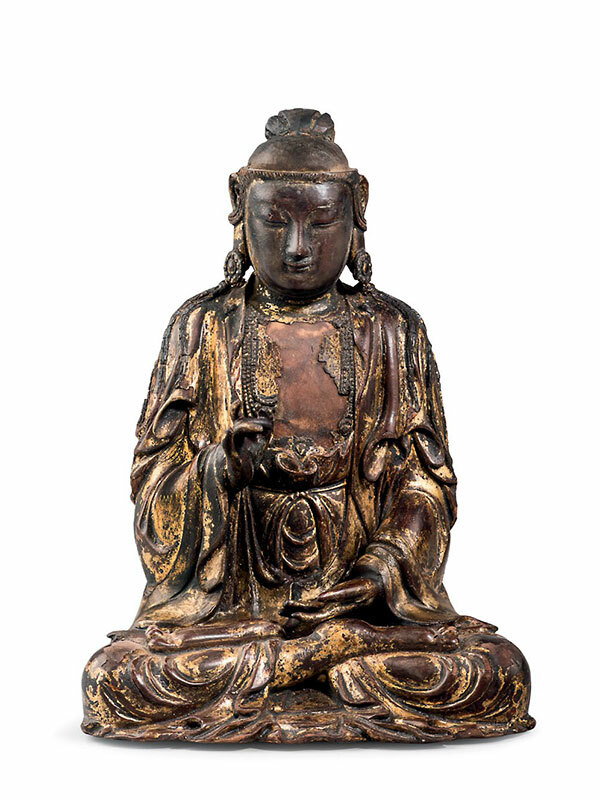 This well-preserved gilt lacquer figure is a rare surviving example of Ming dynasty wood Buddhist sculpture. Small Buddhist images such as the present representation of the bodhisattva Guanyin were made for private worship, or for portable shrines for travelling, rather than for temples. Lacquer, which has been used in China since the late Neolithic period (c. 5000 – 2000 BC), is produced from the resin of a lacquer tree (Rhus verniciflua) found in southern China. The viscous liquid hardens when exposed to oxygen and humidity and because it becomes resistant to water, certain acids and heat, it is often used as a protective coating on wood pieces. A comparable wood Akshobhya Buddha consisting of a single-woodblock construction, similarly covered with lacquer and gilding and of similar size and style, is dated to 1411 of the Yongle period (1403 – 24) and in the collection of the Metropolitan Museum of Art, New York (fig. 1). A further comparable Bodhisattva seated on a lotus base and made of polychrome pigmented wood, dated to the 16th century, is in the collection of the British Museum. The number ‘P81 L.2909.9’ written in red lacquer on the base indicates that it was possibly previously in a museum.